Last March, my grandmother died. She was 90 years old. She lived a good life here in Canada, after immigrating to Montreal from Slovenia in the early 1950’s. This was the first death in the family that my son, now four, would face. He knew my grandmother quite well, seeing her at least a few times a year. I was worried that being at the funeral home with an open casket might upset him. I wanted to prepare him, without scaring him or getting into too much detail. That’s when I turned to my colleagues at the Ottawa Public Library (OPL). I asked them for book recommendations about death that are for young children. I found it reassuring to speak to peers who are familiar with these books and the content. It is no surprise that they were able to recommend a few titles immediately. Talking about death with a child can be difficult, but reading about it, especially in a way that he or she can understand, made it that much easier to discuss. I’m so grateful for the thoughtful and knowledgeable librarians at OPL. If a child in your life is struggling with the loss of a loved one, or if you want to broach the subject with them, please consult the list below. All titles are available at OPL. TItre philosophique et sensible qui raconte la vie d’une fillette curieuse et pleine de joie bascule à la suite de la disparition d’un être cher. Désemparée, la jeune fille met son coeur dans une bouteille pour le protéger. Elle grandit dans la tristesse, incapable d’être disponible au monde qui l’entoure. Un jour, la rencontre avec une enfant plus jeune et encore pleine de curiosité rappelle à la jeune fille les merveilles qu’offre le monde. Pour les enfants de 7-12 ans. Non-fiction for ages 5 to 8. Acknowledges the emotions and confusion young people commonly experience when someone dies, and describes ways to celebrate love and life. A tender, gentle and lightly philosophical story about a girl whose life was filled with all the wonder of the world around her. Then one day, something happened that made her take her heart and put it in a safe place. A story about being open to love, and loss, for all ages (but generally 6 or 7+). Non-fiction for ages 3 to 6. Illustrations and brief text relate how a person might feel when they lose someone they love. The six Bell children develop their unique coping mechanism, involving an elaborate imaginary chivalrous game, after their father retreats into his work following the death of their mother. A story about heartbreak, coping, and make-believe. Ages 8+. An older gentleman tells his grandson about his experiences in World War 2. A story about honoring memory that, while specific in nature, has universal appeal. For ages 5+. "Parfois, la tristesse est très grande, elle est partout, partout." 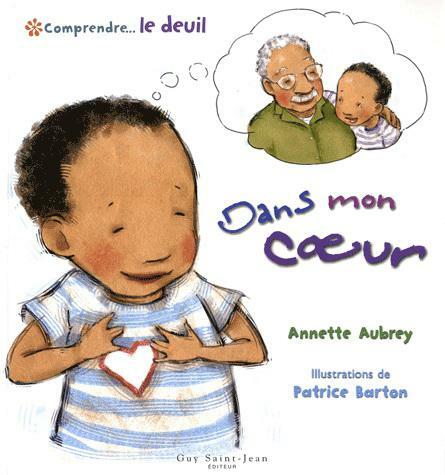 Une exploration très honnête des nombreuses émotions de la douleur et le deuil, inspirées par les propres expériences de Michael Rosen après la mort de son fils. Bien que recommandé pour les enfants de 8 ans et plus, il pourrait être partagé avec les jeunes enfants avec le soutien approprié. Although this book can be a great way to talk about the death of a pet, it’s also a good way to broach the topic generally, and to talk about what lives on after someone dies. The big cat taught the little cat many things; when the little cat grew up, and a new kitten was introduced, the “new” big cat was able to share all the things he had learned with the next generation. Ages 2+. Depuis la mort de son grand-père, Antonin est très triste. Ses parents sont malheureux et lui n'arrive pas à comprendre pourquoi il ne reverra plus cet homme qui lui est si cher. Explorez la pénible question de la mort et du deuil avec votre enfant en lisant cette histoire d'un jeune garçon qui confie sa peine à ses parents et qui tentent, ensemble, de la surmonter. Pour les 3-5 ans. I would like to add a beautiful, moving book that could reassure children of their loved ones in heaven watching over them. This charmingly illustrated books shows of a young boy living during world war two, and how an angel watches over him and keeps him safe. At the end of the book, the main character passes away and watches over his grandson as he goes through life. Moving in its simple message. Thank you for this wonderful list. Thank you for the recommendation Katarina!